Interactive installation evolving with the rhythm of the breathing of the spectators. Exploring the principle of breathing allows us to evoke the territory which constitutes the atmosphere. We share this territory but we modify it with our various activities. There is an interrelationship between the fact of breathing, of have an action on the environment and to breath this feedback. Also, take time to breathe is a symbolic way for taking again conscience of the natural rhythms, (biological and seasons for example) opposite to the productivity. It's also an invitation to the concentration, the meditation. Breathing : link of this creation, can be interpreted like the continuous exploration of the territory which surrounds our body. We could consider, as Elias Canetti said in connection with the writer Hermann Broch, that each person is a form of atmospheric unit: " the multiplicity of our world also consists, for a good portion, in the multiplicity of our spaces of breathing". We have developed a project as a "respiratory heart". A living work, rythmed by various breaths who linked together the audience. Souffles (Breaths) is an interactive and collective artwork where the breathes of the audience gradually reveal the integrality of a generative circular video. 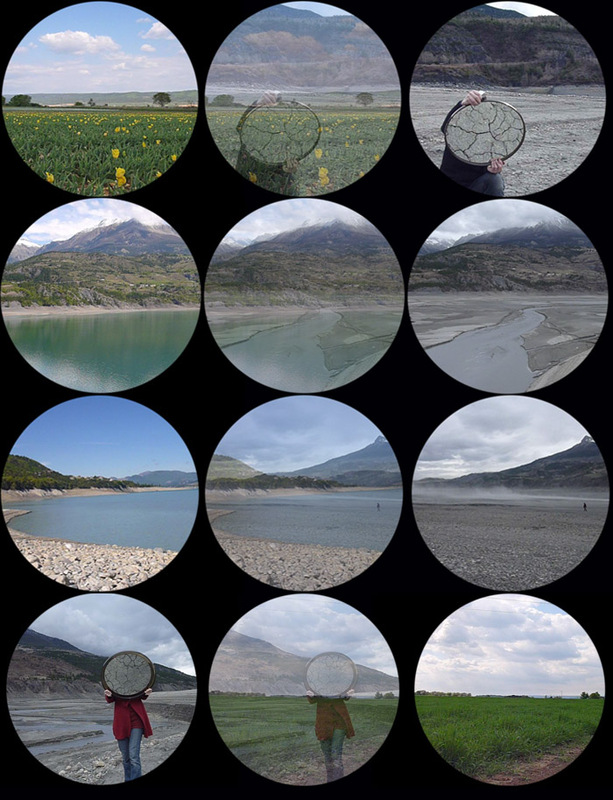 This one is compose of sequences, of landscape video loops shooting during times of production in France. At the same time generative and interactive, this video installation evolves progressively with breathings. The breaths of the spectators reveal the landscapes of the artwork. They generate a visible fog in the center of the lighthouse : the organ of the installation. This creation was realise between september 2010 and october 2011, during various times of itinerant residencies with ZINC - Belle de Mai Marseilles) and Fées d'Hiver (Embrun). The scenography consists of a circular screen in the centre of which a "lighthouse" projects images of landscapes filmed at 360 °. Cette création est coproduite dans le cadre du projet Haut-Bas mené par ZINC et Fées d'Hiver. Haut-Bas est soutenu par le programme AGIR (Action Globale Innovante pour la Région) du Conseil Régional Provence Alpes Côtes d'Azur (SEDATE) avec le soutien de la ville d'Embrun. Many thank's to Marc Limousin, Rémy Rivoire, Maflohé Passedouet, Erik Lorré, Marylou Bonnaire, Emmanuel Vergès, Céline Berthoumieux, Magalie Herbert, Jean-Laurent Del Socorro, Fabien Perucca, Jérôme Holt, Julien Parsonneau, Guy André Lagesse.